The Leo woman is a magnetic person. She has a charming personality and a winning attitude that is unique to her personality only. You can’t expect to see a dull, boring Leo woman because try as hard as she may, she will always be in the center of attention. She will have to make a conscious effort to stay out of the limelight because, very unintentionally, the attention follows her where ever she goes. It will be a pleasure for the Aquarius man to be in the company of the Leo woman because she is dynamic, entertaining and lively. Count on the Aquarius man to be very sociable and outgoing. He is the perfect match for the Leo woman for they are both fond of the outside world. However, whether the Aquarius man likes it or not, he will always be in her shadow. At a party or a social event, the Aquarius man will have to settle happily with the remnants of awe and attention that the Leo woman gets. Whether this becomes a bone of contention for the couple or if the Aquarius man takes it in his stride, only time will tell. The secret to this relationship will lie with the flattering abilities of the Aquarius man. He will have to work harder to keep a smile on his Leo woman’s face. He will have to ensure that his woman stays happy or else, they will have trouble in the house. The Leo woman does not like being told what to do and what to say and if the Aquarius man tries that, he will be in trouble. The relationship between the Aquarius man and the Leo woman will be one where the man will have to make more compromises than the woman. 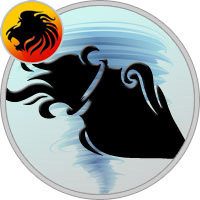 Leo is a very powerful sun sign and to try and restrain it is a big mistake. Thus, the sooner the Aquarius man understands this, the better it will be for him. Since the Leo woman is much like the lion, she will be known for her fearlessness. This is one quality that the Aquarius man will admire in her and treasure. He will love his independence and freedom but will be willing to compromise on it if it brings happiness to his woman. This relationship can blossom very easily and readily into a gorgeous flower but do the wrong things at the wrong time and the couple can face the wrath of the bee-sting as well.